UVic Womyn is calling for financial disclosure and an end to harassment of feminists at the former Womens’ Centre in the wake of a “take-over” of women’s space. The feminist group is demanding the University re-open space for women only. In 1981, the UVic Women’s Centre was established as a women’s lounge and meeting space. In 2016, the collective re-branded it “Third Space” for gender-variant people, and adopted new policies that require members to subscribe to its theory of gender identity. UVic Womyn is also challenging the Third Space collective’s decision to “donate” $3200 of its budget to former financial coordinator Daphne Shaed, a trans person who identifies as a Hindu woman. In September, Nadia Hamdon, the new financial coordinator, quit her position without explanation and the centre is now unstaffed, according to an email from Erin Ewart, the executive director of the UVic Student Society. “We are going to insist on holding Third Space and UVic Student Society accountable for these decisions.,” Prema said. The Third Space website has not advertised any programs or services for students since May. 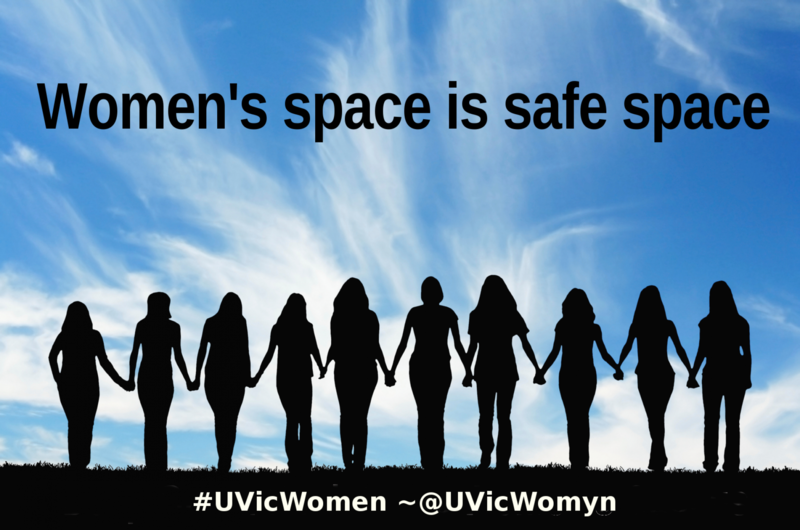 In summer 2016, a Third Space coordinator confronted a UVic student about her support for women’s space, and the student says the collective banned her from the centre for that reason. Students watched in shock as a group of bookfair organizers confronted and verbally abused a student who resembled one of the women on the poster. A bystander intervened and the student was able to get away from the group who tried to chase them down the hall of the SUB. UVic Womyn tweeted that they are not connected to the women on the poster. Regardless, a bookfair presenter from Vancouver posted the women’s names and faces on Facebook. A second bookfair volunteer bragged about confronting the student and complained that organizers should have prevented feminists from attending the public event. One of the women named on the poster is Erin Wallace, a UVic grad now living and teaching in Germany. Wallace had no connection with UVic Womyn at the time of the Anarchist Bookfair. She has filed a complaint with Saanich police, who are now investigating. “The censoring and exclusion of feminists from the campus Women’s Centre by males and their supporters is an alarming symptom of this backlash,” Wallace said. This happened with other womens groups like at the local LGBT Center in Hayward CA. They eliminated ALL womens groups, whether Lesbian or for Lesbians and bi women, while they had groups for gay men, 12 step, queer youth and trans. They were going to have a new executive director who was a woman, and we were all excited!!! Then we found out she was an MTF, so “she” was cold to.my suggestion of creating a Lesbian centred group. Meanwhile the Board of Directors were twisting their hands WHY Lesbians didnt attend their events. I told them.yiu have NOTHING for Lesbians or for women so of course they won’t. We ARE NOT REPRESENTED, SO WE WILL GO ELSEWHERE!!! Lesbians and womyn NEED to take back OUR SPACES!!! The bookfair wasn’t sponsered by the UVSS. The new, male-free, Uvic Womyn's Centre.